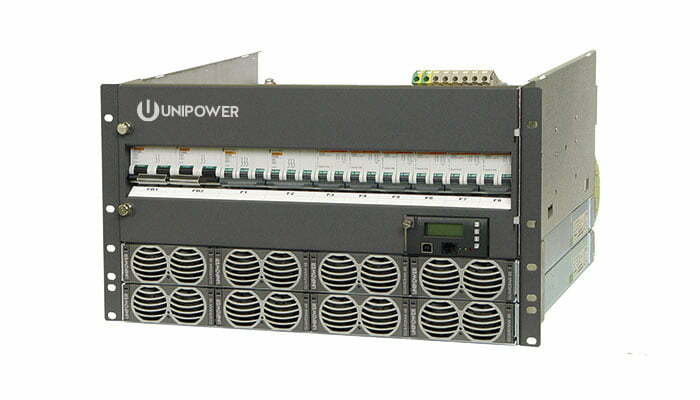 Guardian Access 19 is a 5RU/6RU high 19” rack-mounted, integrated 480 Amp DC power system providing an output of -48VDC. These systems can accommodate up to four (5U) or eight (6U) Guardian family high efficiency hot-swap rectifiers. This 480 Amp DC Power System provides a load current of 400A with additional battery charge current up to 125A subject to an overall 480A. The rectifiers are internally fan cooled with speed control which is a function of load and temperature, keeping acoustic noise to a minimum. The DC output circuits can provide up to 20 loads which utilize circuit breakers with capacities from 4A to 150A plus up to six 100A or 125A breakers that provide battery protection. A programmable low voltage battery disconnect (LVBD) is available with a 200A or 400A contactor; while an optional partial load disconnect (PLD), rated at 125A or 200A and also programmable, can provide non-critical load shedding when operating on batteries. Looking for the 23″ rack-mount version of this product? Click HERE.